It’s taken a while for the official news to come through on the two Community Group Grants I applied for. So it’s good new and not so good news. The great news is that we were successful with our grant application for upgrade work to the Burnley Bouldering Wall. This will focus on improving the area itself rather than the wall. The grant money will fund a matting path/pavers between the two walls. Bicycle racks will be installed. An interpretive sign will be errected explaining the wall and bouldering to less climbing knowledgable visitors. The gravel area between the two walls has been commented on many times over the years. Switching between climbing on each one means much of the gravel gets walked around and onto the mats not to mention the soles of climbing shoes not liking gravel too much. With many of the people who visit the wall riding their bikes there, space for parking them is becoming limited. These racks will provide more safe space for locking up bikes should you want to and keep the bikes out of the main climbing wall area. The wall is a facility that is used by many, some are climbers and some are families and visitors who are curious about the background of the wall and the techniques of bouldering. This interpretive sign which will be situated near the path end of the vertical wall, will give a condensed outline of bouldering. Work days will be organized for this in the new year so stay tuned via all the channels such as VCC website, cliffCare website,facebook pages and Chockstone. Drop us a line to let us know you’re keen to help out. 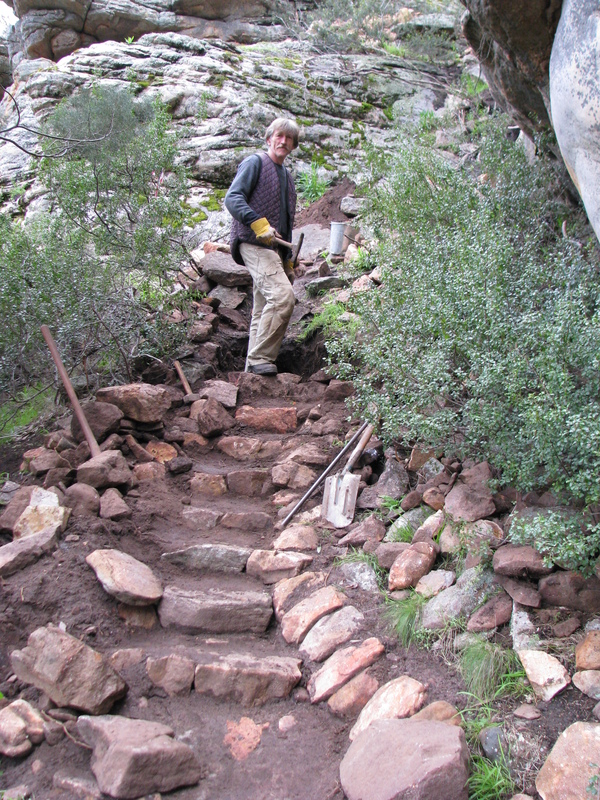 Our ongoing project at Mt Arapiles, the Pharos gully Repair project unfortunately missed out on funding this year. We are coming very close to the end of this project and there is no way that this setback will hold us up. Never fear rockhaulers…..I have plenty of rocks still for you to haul. We shall have to find some funding in other ways in order to continue to employ our stonemason. This entry was posted in Arapiles, Grants & Funding and tagged arapiles, burnley, cliffcare, volunteers erosion by Tracey. Bookmark the permalink.